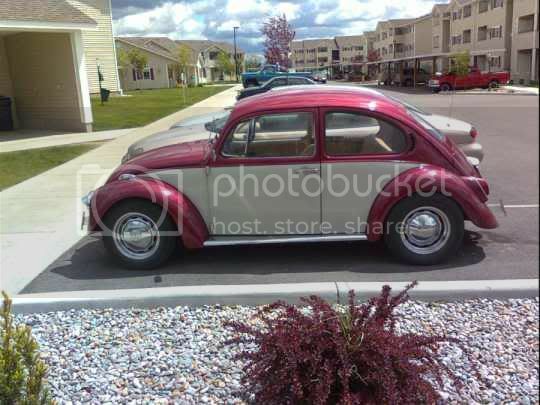 River City Volkswagen Club :: Hi, I'm new and here's my bug. Hi, I'm new and here's my bug. Posted: Sun Jul 19, 2009 4:03 pm Post subject: Hi, I'm new and here's my bug. Hi, my name is Adam, I live in the valley. I bought this bug back in March and on the way home it decided to not work anymore (trying to figure out the problem). Anyway, great site. What he said plus welcome. Well, I bought it in Seattle and about half way home it started revving to full throttle without me even having to press the gas pedal. Now when I start it it revs to full throttle. I have been told that it is possibly a vacuum issue. It has dual Solex 35s and from what I understand when using these you need to vent the crankcase which the previous owner did NOT do. After looking into the car it turns out it is quite the frankenstein. Here goes. It's a 66 pan with a 72 body and various other parts, including the axles which are different somewhere between those years. The ones on it are too long which I believe are from the 72. I really just want to swap from the dual carbs to a single weber or something just to keep it simple. Anyway before I make a wall of text...thanks for the warm welcome, I hope to get her running soon. Check to make sure the manifolds and carbs are bolted down tight and the choke isn't sticking. Also check your timing. I've got a weber progressive I'd love to switch to dual carbs but I dislike webers and think you'd be happier with what you've got. I'm not sure what you mean by axles being too long, is it swing axle or IRS? Posted: Tue Jul 21, 2009 2:00 pm Post subject: Hi, I'm new and here's my bug. no doubt you've checked this,but...Is the throttle cable and linkage free and clear? Well, after all of my speculation and heartburn, it turns out to be the simplest thing...throttle return spring. I'm such a bonehead. Lesson learned. While working in the engine compartment I noticed a few other things that need immediate attention, the bolts holding the alternator to the shroud...all missing, after replacing the alt pulley it wobbles need to replace the pulley cuz it's shot, and re shim. But the good news is there isn't anything wrong that cant be fixed. Thanks for the help guys.